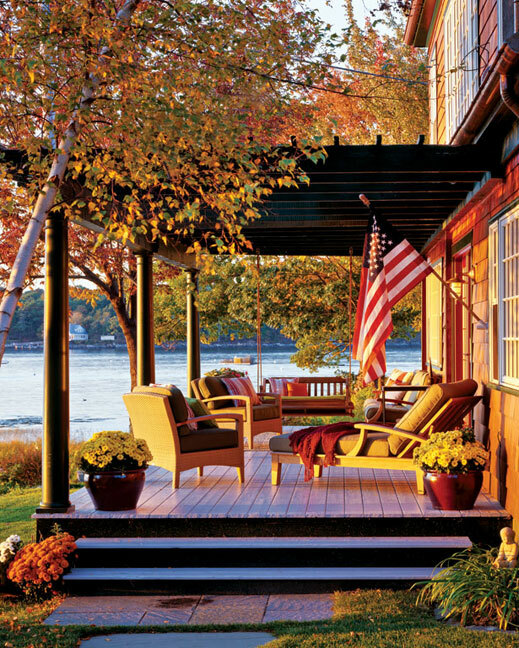 Tim and Liz Williams renovated a classic Peaks Island cottage. Now it’s the life of the island party. Tim and Liz Williams’ classic Peaks Island cottage was in such rough shape the November they moved in that the only heat was from a central chimney with double fireplaces. The wind blowing through the rattly windows quickly extinguished a match. And the interior was barely insulated. “It was bleak,” confirms Tim, a retired broadcaster who grew up near Portland. The couple’s first winter on Casco Bay brought one hundred inches of snow and an April Fool’s blizzard. After thirty-six years in Boca Raton, Florida, they lasted only one here. But they loved the island — Maine’s most populated — and have returned every summer for twenty years. They made some renovations right away — installing insulation and woodstoves; they picked away at others — adding windows and a deck and turning a downstairs bedroom into a sitting area. But to fix the awkward entry — a sliding glass door into the dining room — and make better use of an attached shed, they hired architect Will Winkelman, who lives on the island and commutes by ferry to his Union Wharf office in Portland. Winkelman replaced the shed with an entry hall and easy-to-find front door. Off the end, he added a laundry area. Above is a second-story mini kitchen, additional laundry room, and storage. He also expanded the master suite and reduced a second-floor bedroom to insert a master bath with natural, stone-tile flooring and marble walls, while working with the cedar-shingled house’s original flanking gambrel form. One example is the new, floor-to-ceiling cabinets in the living room, the top shelf of which holds a collection of books written by Tim’s grandfather, Maine author Ben Ames Williams, who is so beloved that the town of Union holds an annual celebration in his honor. Williams most recognized book, Come Spring, which features the town, sits above a collection of shells and family photographs. Winkelman also maximized the view. From the moment one opens the front door, the gaze is drawn through the windows to the water outside. In keeping with the cottage style, Winkelman chose antique, resawn heart pine for the floors and bead board ceilings, using coffers to hide exposed beams without losing headroom. A pair of french doors opens to a waterfront pergola with generous cushioned chairs and a hanging swing facing a private beach on the bay. Because the Williamses have a large family and often entertain, the downstairs is designed around five separate sitting areas, including a round entry table, a main table beside the kitchen, a group of over-stuffed chairs in the converted bedroom, and a couch, table, and chairs in the living room. A downstairs guestroom faces the sand and pebble beach. A narrow flight of stairs leads to two additional bedrooms and a romantic master suite with an elegeant toile canopy, crystal chandelier, and French provincial furniture. The Williamses often sip their morning coffee sitting in a pair of rounded chairs, while watching passing boats. To maximize the natural light, the interior is creamy white, with splashes of color, such as the red wicker dining room chairs, vibrant area rugs, and throw pillows. Two interior decorators from Roger Christopher Interior Designs, who summered on the island, chose the furnishings. The Williamses donated old furniture (a selection of hand-me-downs and flea market finds) to the island’s annual auction. The house, which was built in 1903, originally sat by the road, says builder Bill Bunton, of Cumberland, who summered on the island as a kid. It was moved closer to the shore in the late 1960s. The cottage was built for the unmarried Witlow sisters in exchange for taking care of their wealthy neighbor, Old Man Skillings, who lived just up the hill. But the cottage, which the Williamses call “Ocean Side,” didn’t come with much land. So they purchased an abutting cottage, which they renovated and nicknamed “Topside,” after a house Tim’s mother owned in Georgetown. An outdoor fire pit encircled by Adirondack chairs brings the houses — and the neighborhood — together. “Until I tell them, ‘I’m going to call the police if you don’t leave,’” Tim jokes. Having begun construction in the fall, Bunton finished the following June, just in time for the Williamses’ two hundred-person lobster bake on the beach. The day of the party, the landscape crew finished laying sod, and a bluestone terrace flanked by potted flowers funneled guests toward the new front door. Meadow Rue Merrill is an award-winning journalist who is currently working on a memoir, Redeeming Ruth.